One of my favourite Canadian television shows is Little Mosque on the Prairie. I enjoy its gentle humour and its light-heartedness. Its comedy is so subtle that it does not even have a laugh track. To me, that's refreshing. The series was created by producer Zarqa Nawaz. She is a Muslim of Pakistani origin who was born in Liverpool, England and raised in Toronto. She now lives in Regina, Saskatchewan. Nawaz describes herself as a "Muslim feminist." Little Mosque on the Prairie first aired on CBC in 2007. It centres on the lives of a Muslim community in the small fictional town of Mercy, Saskatchewan. The community has rented space for its mosque in the parish hall of an Anglican church. In the post-9/11 world, the portrayal of Muslims is a very sensitive undertaking. It is impossible to please everybody and criticism from Muslim and non-Muslim is inevitable. Some are bound to be offended. Little Mosque has not escaped criticism, nor should any television program. Healthy debate is necessary and welcome, especially in the case of a show like Little Mosque, which arouses sensibilies. The series has been attacked for being shallow and for not really dealing with serious issues. Canadian writer and produce Ken Finkleman, who is best known for the CBC series The Newsman, expressed a dim view of Little Mosque. He said that there is “deep confusion and racism about the place of Islam in the Western world and it’s the thing that’s broiling up under everything in the world, and the show presents this world where everything is happy." Conservative critics detest Little Mosque on the Prairie. They say that the series is too politically correct. They claim that it does not address some real issues in the Muslim community such as "honour killings" and the treatment of women. Nawaz has responded to these criticisms by stating that the primary purpose of the show is to be funny, not to be a political platform. It aims to highlight the strengths, weaknesses and foibles that are found among Muslims and in all races, religions and cultures. On February 11, 2011, CBC announced that Little Mosque on the Prairie has been renewed for a sixth and final season. I will miss it when it finishes, but six years is a good run for a television sitcom. Little Mosque's fans are certainly looking forward to Season Six. Little Mosque on the Prairie is groundbreaking in the sense that it was the first Muslim sitcom in North America. In a comedic fashion, the series has opened up some much-needed dialogue concerning the portrayal of Muslims on television and their relationship with non-Muslims. It deals with the very real misunderstandings and misconceptions between the two groups. One of the stars of the Little Mosque on the Prairie is Zaib Shaikh. He portrays Amaar Rashid, the beleaguered imam of the small town mosque. Amaar changed his life drastically when he left his comfortable career as a lawyer in Toronto to lead a small community of Muslim faithful in a sleepy prairie town. His liberal views come into conflict with the more conservative members of his congregation. Amaar is not your stereotypical imam. He is clean-shaven and he sometimes wears jeans. In last season’s final episode, he married Rayyan, the town’s feisty doctor, played by Sitara Hewitt. Rayyan is a headstrong, devout, hijab-wearing feminist. As reverent Muslims, Amaar and Rayyan were not permitted to touch each other before their wedding. The season ended with the newlyweds going off on their honeymoon and trying to decide whether to remain in Mercy or to accept Amaar’s job off offer in Montreal. 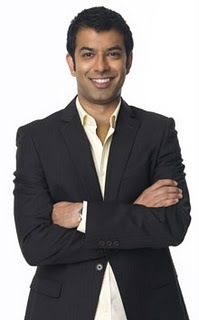 Zaib Shaikh was born in Toronto, Ontario in 1974. He is a Muslim of Pakistani descent. Zaib studied theatre and drama as part of the joint University of Toronto/Sheridan College He also holds a Master of Fine Arts from the University of British Columbia. Zaib has worked and performed across Canada as a writer, director, actor and producer. Prior to taking on the role of Amaar on Little Mosque, he played the part of Vancouver city councillor Shakil Khan in Da Vinci's City Hall. I wonder if Little Mosque is too Canadian for Americans to embrace or if our neighbours to the south are ready to accept such a series. My hope is that if any of my American readers have seen the show, they will contact me and let me know their point of view. In December of 2010, U.S. news anchor Katie Couric remarked that maybe America needs a Muslim version of The Cosby Show. I'm not sure Little Mosque on the Prairie fits that description. The Cosby Show has been accused of being a sanitized depiction of the black experience in America. Little Mosque has been criticized for not being a realistic portrait of Muslims. Perhaps that is where the similarity ends. Not surprisingly, Katie Couric received a great of flak from right- wingers for her remarks. The point, however, that Couric tried to make, is that American television is in need of a show that puts a human face on Muslims. For five years, Little Mosque on the Prairie, has done just that on Canadian television. To watch a video of Zaib Shaikh's reaction to Couric's comment (during his appearance on George Stroumboulopoulos Tonight), click on the link below.